At G&H Specialty Concrete, Inc., our business is polished concrete floors, dyed concrete, acid stained floors, stamped concrete, logos, epoxy and specialty toppings. 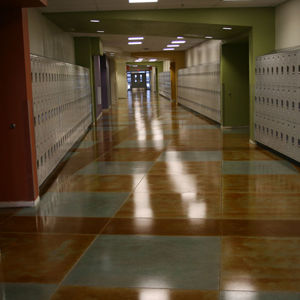 Our polished concrete floors, dyed concrete, acid stained floors, stamped concrete, specialty logos; epoxy and specialty toppings are found throughout the Albuquerque and surrounding areas in government facilities, schools, retail, commercial and residential applications. We provide all Specialty Concrete services to architects, business owners, general contractors, home owners and project management companies. We see your specialty flooring project through until the end; from the specification process if necessary to maintenance of your project. 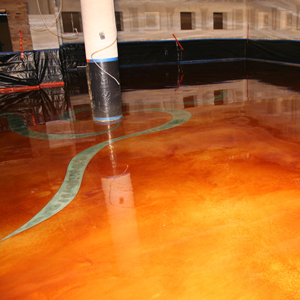 Utilizing the best concrete polishing products, tools and equipment available, we can ensure a successful installation of your polished concrete floors, dyed concrete, acid stained floors, stamped concrete, specialty logos, epoxy and specialty toppings. At G&H Specialty Concrete, we try to utilize whenever possible or requested environmentally friendly concrete systems. These green concrete products and sustainable processes have a proven success record. We use the most advanced equipment and constantly update our Specialty Concrete methods to stay on the cutting edge of this rapidly changing technology. Our goal as a company is to provide all architects, engineers, builders or contractors, with a decorative concrete system which will highlight your projects. G&H Specialty Concrete provides the experienced innovated designs via a team effort through a spectrum of competitively priced products of the highest quality to help transform your home, office, showroom or public building into a new space that exceeds all expectations. While our business philosophy begins and ends with our clients’ utmost satisfaction, we are also committed to beautifying our community. We strive to provide the best techniques necessary to each project’s requirements while offering the widest selection and best value in the industry. Our continuous pursuit of excellence through research, testing, knowledge, and application, will continually grow and strengthen this organization. This was a brand addition to this school in Albuquerque, New Mexico that had a failed Acid Stained floor from the original contractor. We came in and ground off the failed systems to ensure proper profile and preparation. We then systematically taped off and stained the floor as specified and sealed. La Cueva High School in Albuquerque, New Mexico started life as a exposed aggregate floor. After many years and excellent service from this floor the removal of gum became to much to maintain. 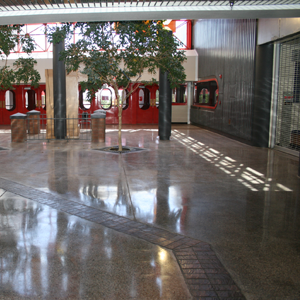 The Albuquerque Public School System decided to have this floor refurbished with Polished Concrete Floors. Chows restaurant, in Rio Rancho New Mexico, started off as a old painted floor. The coating was diamond grinded off and the floor left to proper profile. Then installed was a Microtop Coating so we had a new surface pallet. We then saw cut in decorative designs and chemically stained.